With less than a month to go before Poole Maritime Festival comes to Poole, the plans for the exciting line-up of family entertainment as part of the week long festivities are beginning to take shape. Focusing around the prestigious European Maritime Day, one of the largest maritime events in Europe which will be held at Lighthouse, Poole, on 18 and 19 May 2017, the family entertainment embraces all things maritime. Kick starting the family entertainment on Thursday 18 May and Saturday 20 May, is Valise Noire Storytelling Theatre as they present CARGO, a dynamic new outdoor performance bringing Poole’s maritime heritage of The Great Quay to life. Watch as the ‘Queen Galadriel’ ship sails into port and a crew disembark to celebrate a millennia of goods passing through the Great Quay. This dynamic interactive performance procession unfolds mysteries of cargo travelling the seas. Stories from above and below the flowing waters, reveal wisdom and heritage of maritime life. Watch the free performances as the precious cargo is transported along Poole Quay to the Sea Music sculpture. If you would like to get involved as a participant in the procession visit the resources page on www.valisenoire.com/ to register. You can also find on the website additional ways to get involved. 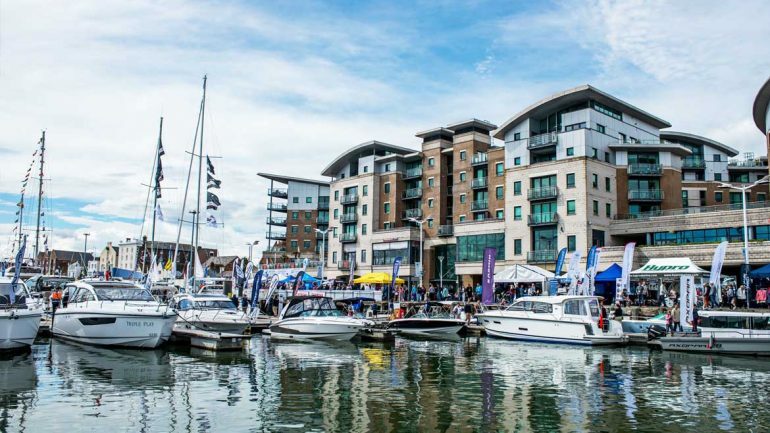 Over three days from Friday 19 May through to Sunday 21 May, the third free Poole Harbour Boat Show organised by Poole Harbour Commissioners in association with Sunseeker, will be bigger and better than ever with a full weekend of entertainment. The central stage will showcase musical talent from across the region plus tall ships and, for the first time, spectacular Royal Navy and Border Force demonstrations. The on-water demonstrations are always a popular attraction and there will be an exhilarating display of ‘flyboarding’. Attached to a jet ski, the flyboard can send the rider up to ten metres in the air, whilst doing various spins and tricks. Visitors will also be able to check out the latest sail and motorboats of all sizes, RIBs, chandlery products, clothing and water-sports accessories. Seven Seas Festival 2017, organised by Immense Events, is a free family festival of world food, music and culture. Seven unique areas take you on a journey through the seven seas, to experience food, music and culture from around the world. With Poole Harbour BIG Wheel, seven stages, seven bars, live bands, world street food, VIP area, craft beer and cider, funfair, free kids workshops, ice skating rink and quirky craft stalls there’s something for everyone. Based at Harbourside Park the Seven Seas Festival runs from Friday 19 May through to Sunday 21 May. Taste of the South is a brand-new free event which showcases products and producers from across the South of England taking place in Poole Park from Friday 19 May through to Sunday 21 May. The event features artisan food, drink and produce stalls, cookery demonstrations and show special offers and maritime themed children’s activities too. There is even a new start up business area, as well as south coast experts, chefs and demonstrations. There will be something for everyone to enjoy this summer at Taste of the South. Organised by ROUTEpr it is set to be a true celebration of the south.